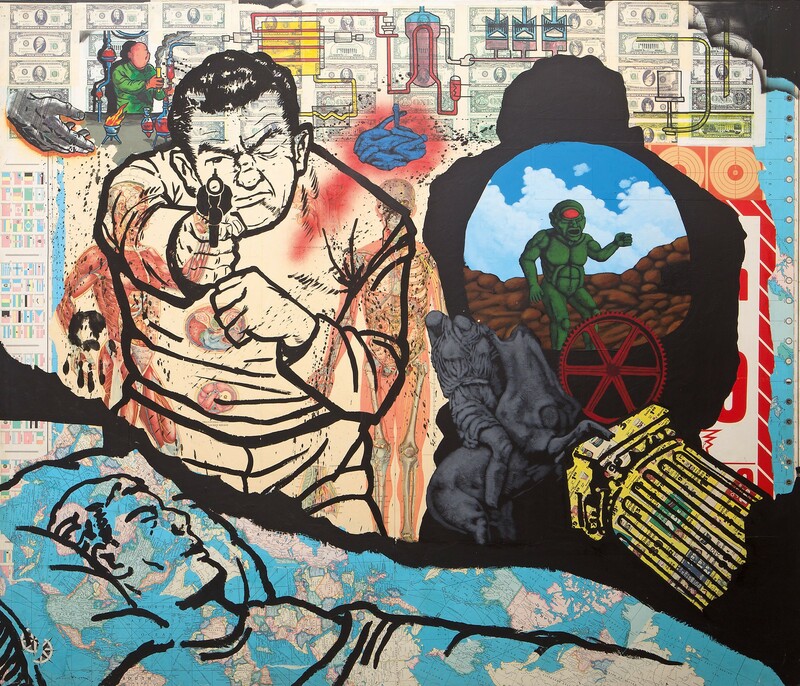 I was finishing a late-aborning BA when a professor introduced me to the works of David Wojnarowicz. No doubt she fathomed that he could be a model for the writing I was attempting—autobiography of a frank, sexual nature that also had very much to do with loss and the times in which I came of age. Reading his work gave me permission; we were also contemporaries, which made made me not feel so alone in my autobiographical pursuits. If you happen to be in NYC you can see, and hear, the breadth of his vision at the Whitney Museum. They’ve mounted David Wojnarowicz: History Keeps Me Awake At Night (on view through the end of Sept) in a survey that will haunt your dreams. Yes, there’s more writing, some of it well known from other group shows of gay artists (his stunning mashup of image and text titled Untitled (Someday This Kid)powerfully defines both the homophobia of American society and how gay consciousness dawns in an individual with a devastating economy). You will want to linger in the spacious kiosk where Wojnarowicz’s own voice gives power and pain to topics that range from sexual attraction to his run-ins with the morals squad we called government back in the 1980s. His visual range is on display in stark photos, paintings ablaze with color and symbols (look for the “marching sperm”), sculptures and collages that make you want to do nothing except stare and fall back into a time before the universities churned out MFAs whose high concept art lacked that most essential ingredient: soul. Across all mediums Wojnarowicz excelled at an art that was nonfiction at its most incisive, shining highbeams on himself and American societies—middle America, bureaucracies, the art world, and gays-in-Plague-despair—through filters of absurdity, righteous anger and a mournful delicacy that the times cried out for. That I didn’t sleep last night may attest to his work’s lingering power. It reminds us that history—the past, and its real-time correlative—is keeping us all awake at night. It should. Maybe we haven’t contracted a virus (as Wojnarowicz, who died of AIDS in 1992, and many others did) but his assertion that “it didn’t take me long to realize I’d contracted a diseased society as well” is as true of our own times as it was of his.